A stay at Radisson Blu Badischer Hof Hotel places you in the heart of Baden-Baden, within a 10-minute walk of Casino Baden-Baden and Friedrichsbad. 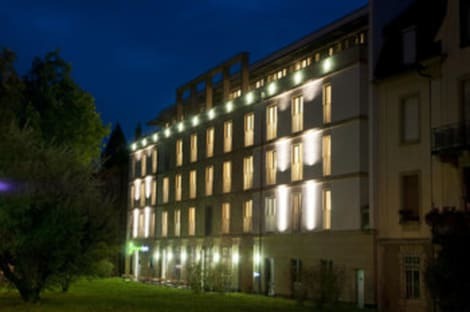 This 4-star hotel is 0.5 mi (0.8 km) from Caracalla Spa and 18.6 mi (29.9 km) from Mummelsee. With a stay at Roomers Baden-Baden, Autograph Collection, you'll be centrally located in Baden-Baden, within a 5-minute drive of Casino Baden-Baden and Caracalla Spa. This 5-star hotel is 2 mi (3.2 km) from Friedrichsbad and 18.2 mi (29.3 km) from Mummelsee. Overlooking the Black Forest, the Leonardo Royal Hotel Baden-Baden is located in a peaceful area of Baden-Baden and offers easy access to sights such as the Festival Theatre and Brahms' House. Treat yourself to a massage or take a dip in the indoor pool, choose from freshly prepared dishes in the restaurant and unwind with a drink in the bar or on the terrace. Each room is equipped with modern comforts including free Wi-Fi, HD TV and en suite bathroom stocked with Sea of Spa products. The Lobby is small and welcoming. Please note the reception is open until 10 pm and there is a night porter on duty until 12 pm. If clients are arriving after this time, please call the hotel reception in advance to see if arrnagements can be made. Peaceful Baden-Baden accommodation close to the Festspielhaus concert venueHoliday Inn Express® Baden-Baden hotel places you an eight-minute drive from Baden-Baden train station.There's a bus stop across the street from the hotel, and the A5 motorway is just a short drive away. It’s less than 20 minutes by car to Karlsruhe/Baden-Baden Airport (FKB). The hotel is a 15-minute walk from the centre of this Black Forest spa town. Here, you can discover fascinating ancient ruins of Roman baths, or indulge in thermal bathing and wellness treatments at the Caracalla Spa. Near the hotel, the grand Festspielhaus opera house and concert hall hosts a vibrant annual performance programme. Not far away, Casino Baden-Baden provides classic gaming and glitzy nightlife for a smartly dressed crowd. Corporate guests can make use of the hotel's Business Centre.At this hotel you can enjoy:- Inclusive Wi-Fi- Express Start™ Breakfast included in the room rate- All Day Dining- On-site underground parking at a daily rateThe relaxed Express Café & Bar serves drinks and snacks, including pizza, around the clock, and there’s a garden terrace to enjoy during fine weather. Our welcoming Next Generation guest rooms all come with flat-screen TVs, as well as high-quality bedding, blackout curtains and pillow menus to guarantee a great night's sleep. 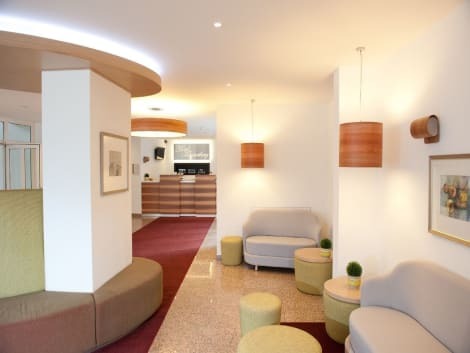 With a stay at Allee Hotel Leidinger, you'll be centrally located in Baden-Baden, steps from Cistercienserinnen-Abtei Lichtenthal and Cloister Lichtenthal. 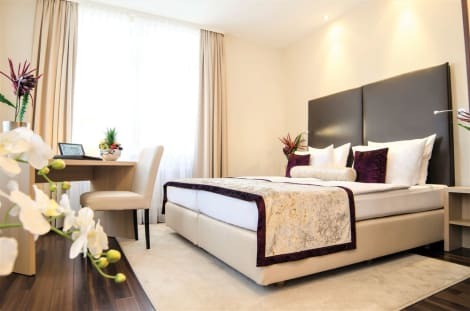 This hotel is within close proximity of Brahmshaus and Lichtentaler Allee Park.Rooms Stay in one of 18 guestrooms featuring flat-screen televisions. Complimentary wireless Internet access keeps you connected, and satellite programming is available for your entertainment. Private bathrooms with showers feature complimentary toiletries and hair dryers. Conveniences include phones, as well as safes and desks.Amenities Take in the views from a terrace and make use of amenities such as complimentary wireless Internet access.Dining A complimentary buffet breakfast is served daily.Business, Other Amenities Free self parking is available onsite. Located in Baden-Baden (Baden Baden Old Town), Hotel Merkur is within a 10-minute walk of Casino Baden-Baden and Friedrichsbad. This hotel is 0.4 mi (0.6 km) from Caracalla Spa and 17 mi (27.3 km) from Mummelsee. With a stay at Dorint Maison Messmer Baden-Baden in Baden-Baden, you'll be a 4-minute walk from Casino Baden-Baden and 9 minutes by foot from Friedrichsbad. 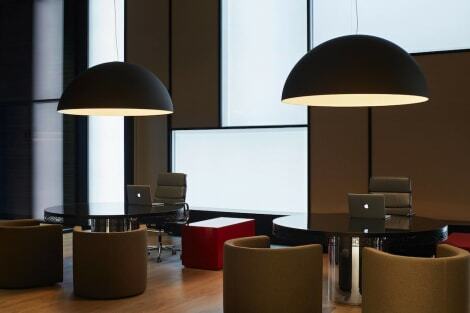 This 5-star hotel is 0.5 mi (0.8 km) from Caracalla Spa and 17.2 mi (27.7 km) from Mummelsee. Its very name translates as ‘baths' – and Baden-Baden's therapeutic hot springs have been renowned since Roman times. Welling up from a depth of 2,000 metres, the springs feed 12 thermal spas in the German town, which became popular in the 19th century and was visited by Queen Victoria. The water reaches temperatures of up to 68°C and is used to treat conditions from cardiovascular problems and respiratory ailments, to rheumatism and joint complaints. Nestling in the foothills of the Black Forest, on the banks of the River Oos, Baden-Baden is also a ski resort in winter. Golf, tennis, hiking and mountain climbing are all popular here. Book one of our Baden-Baden hotels and experience its charm for yourself. Baden-Baden has two castles: the Hohenbaden Castle or Old Castle, and the New Castle, both of which were home to the town's rulers, known as margraves. The Old Castle was built in 1102 and is now a ruin, but still has spooky dungeons and winding staircases up to the lookout point, which offers magnificent views. The castle is free to visit, and guided tours are available. The New Castle, which sits atop the Florentinerberg hill, isn't open to the public, and its entire contents were sold by Sotheby's in an auction in 1995. You can still enjoy lovely views from the terrace in front of it though. At the foot of the hill are the remains of the town's Roman baths, which you can explore through a guided tour or on your own with an audio guide. The magnificently gilded casino, designed to resemble a French palace, was at least as much a favourite with the rich and famous in the 19th century as the thermal springs. Housed in the elegant Kurhaus concert and events hall, the casino and its rooms are open for guided tours each morning, and the garden is also worth a visit. This famous riverside boulevard, perfect for jogging, cycling or strolling, is really a park and arboretum. Lined with elegant mansions, it is home to around 300 types of plant, including azaleas, chestnuts, dahlias, gingkos, limes, magnolias, maples, oaks and sycamores. It also houses the Frieder Burda Museum, whose modern art collection comprises some 500 paintings, sketches, sculptures and objects from 1900 onwards, including works by Pablo Picasso and Jackson Pollock. A few minutes' drive from the town is the Black Forest National Park, whose hundreds of hectares of woodland you can explore alone or through a guided walk. Even the drive there offers excellent views of the Rhine Valley and the Vosges mountains. You can also get there on the 245 bus. The walk up to the top of the 2,191-foot Merkur mountain, Baden Baden's highest point, is a delightful trek through lush countryside. But if you don't fancy the exertion, you can take the funicular railway, a tourist attraction in itself, which will whisk you up in less than five minutes. The railway is open between 10am and 10pm. There's a restaurant at the top, as well as a lawn and a playground, and the panoramic views from here are incredible. You can even take a tandem flight on a paraglider for an unsurpassable vista.